Would you like to be able to choose your own hours of work, location and your work schedule for the day? This opportunity is in the personal development industry of success education, our business offers products, tools and system for people to achieve great success and results in their lives. If you are highly motivated and driven by success, seeking to create financial security under your own direction. Be able to enjoy what you are doing and get paid what you’re worth. No experience or special skills required all training and ongoing support provided by market leaders in the business. 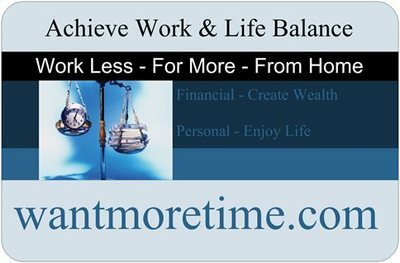 You do need to be motivated, coachable and able to follow a simple proven system that will create abundance in your life – Time – Money. Does this interest you: • Flexible Work Hours • Part Time to Full Time to suit your circumstances • Flexible Work Location • Work from Home or anywhere that is suitable for you • Definitely No Cold Calling If you are serious about changing your current situation: Go to www.wantmoretime.com and complete the information form to be contacted for a brief discussion to see if this is right for you. Please note that this is a self employment opportunity, you will need to be a self starter and able to follow simple, proven steps to success.